With its absolute beachfront location, the exclusive Beach Club offers an intimate holiday experience. This two storey boutique hotel has beach front views and luxuriously appointed rooms in a contemporary design. Beach Club facilities include an infinity edge pool, Club Lounge and Bar, VIP buggy chauffeur service, 24 hour reception free WiFi Intenret and restaurant. 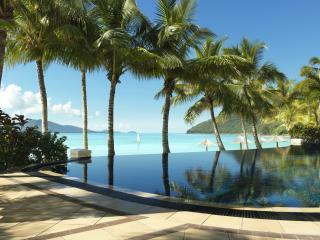 The Beach Club allows you to indulge in some of the finest service the Whitsundays has to offer. Children are not accepted at the Beach Club. Located throughout the island are a range of individual self-catering accommodation, including apartments and houses which sleep from 1 to 8 people. Situated amidst their own grounds, most share landscaped gardens and a swimming pool. There are a variety of styles and prices including studio, split level and two storey. All these Hamilton Island Holiday Homes include a complimentary 4-seater buggy. 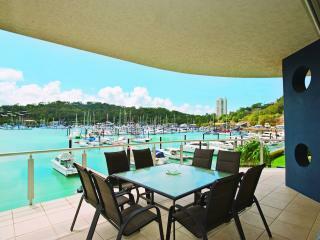 Hamilton Island Holiday Homes are ideal for small to larger families visiting Hamilton Island. A 3 night minimum stay applies. Yacht Club Villas have prime position on Hamilton Island with each villa overlooking Dent Passage and surrounding islands. Idyllically set each villa is luxurious and offers self catered facilities, close to the Marina area and nearby Yacht Club Restaurant & Bar. 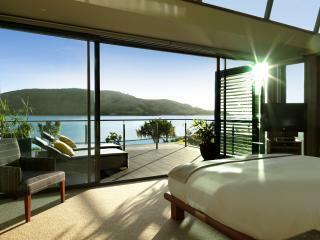 Guests can enjoy premium facilities at Hamilton Island Golf Club on Dent Island. This Hamilton Island Accommodation is perfect for small groups & families for your next Island getaway. The Palm Bungalows are delightful free-standing bungalows each with their own balcony overlooking tropical gardens. The rooms are spacious and feature their own private balcony. 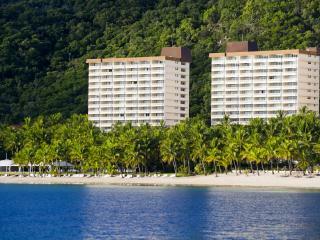 This Hamilton Island accommodation is located close to the Resort Centre, swimming pool, restaurants and Catseye Beach. This is the perfect option for those who want a romantic, affordable island holiday with the added privacy that a garden bungalow provides. The upper most floors of the Reef View Hotel boast a range of luxuriously appointed suites, including Reef Suites, 1 & 2 bedroom Terrace Suites and Presidential Suites. Each suite has a private balcony which overlooks the spectacular vista of the Coral Sea the Whitsunday Passage and Hamilton Island. The lower floors feature spacious, well appointed hotel rooms with either garden views or clear coral sea views. The Reef View Hotel features four external glass lifts allowing guests to make the most of the view. The hotel also offers its own bar, restaurant, shop and swimming pool, it is a popular choice for couples and families travelling to the Whitsundays. The Whitsunday Apartments on Hamilton Island combine the convenience of hotel facilities such as housekeeping and movies on demand, with the flexibility of a full size kitchen. Offering landscaped gardens including a pool and spa, the Whitsunday Apartments are perfect for guests looking for a little independence while on their Hamilton Island holiday. The Whitsunday Apartments are ideal for families and couples after a self catering holiday to the spectacular Whitsundays.